Roberts Fusion review | What Hi-Fi? Compact, no-nonsense and purposeful: that’s the Roberts Fusion. 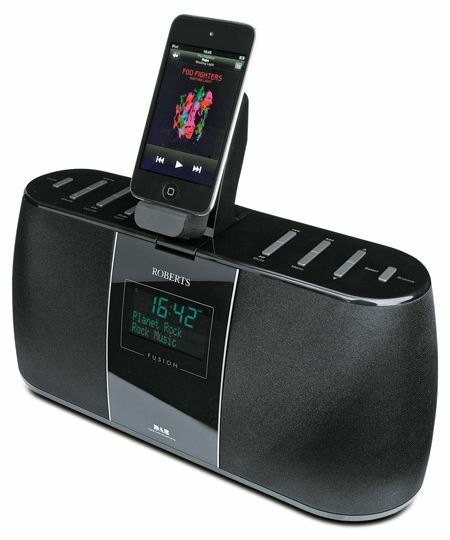 This mid-sized unit comprises DAB and FM, plus a flip-out dock for your iPod/iPhone. On the front you’ll find a screen that clearly displays all the info you could want from broadcasts (including signal strength) and your iDevice, but it’s the Fusion’s remote control that deserves a special mention. This games-console-esque controller feels a million miles away from the usual flimsy, credit-card wands favoured by some makers. Fire up the main unit and you’re greeted with reasonable articulacy. The Fusion does a decent job of holding on to broadcasts, and serves up a nicely detailed, well-separated soundstage. However, the bass is a little on the boxy side and the treble a tad hard, but there are EQ presets to help tame this to an extent. Time to hook up our shiny iPhone. Push the button on the dock and it rises gracefully from the back of the unit; once ready, you can attach to it one of a variety of supplied device-holders to keep your portable secure. Duly connected, the results are fine but not earth shattering. With a WAV of One Angry Dwarf and 200 Solemn Faces from Ben Folds Five’s seminal Whatever and Ever Amen playing, we noticed a touch of hesitancy in the Fusion’s dynamics and rhythmic punch, though not enough to be annoying. Roberts Fusion: VerdictAll of which sums up the Roberts: rather than ‘outstanding’ and ‘exciting’, the unit instead offers ‘reasonable’ and ‘decent’. We wanted to love the Fusion – it’s a decently detailed listen, after all, and packs in a fair amount of features for your £150, but its sound is bettered by some rivals. So unless you really want a built-in iPod dock at this price, we think you can do better elsewhere.